This property has had 114 views in the last 3 days! What to Bring" list can also be viewed on our website under the Guest Services tab. "Linens Included" terms: COMPLIMENTARY BED & BATH linens for ANY reservation in 2019! Includes all bed linens, bath sets, and pool towels for number of guests in reservation. Welcome to Topsail Manor, a truly unique jewel on Topsail Island. Newly constructed in late 2017, Topsail Manor is a grandiose, eight bedroom oceanfront manor that boasts luxurious amenities, spacious accommodations, and elegant coastal décor. Designed to accommodate large groups, Topsail Manor’s approximately 8,000 square feet provides the perfect venue for weddings, reunions, multi-family vacations, and corporate events. Upon arrival to the manor, you find a beautifully designed home with ample parking, manicured landscaping, and a “grand” entrance with beautiful wooden double doors. Once inside, you are greeted with a curved staircase and elegant crystal chandelier in the foyer. Use the beautiful staircase or the hydraulic elevator to access the main floors! Move along upstairs to the first floor where you will find hours of entertainment amenities! The first floor living area provides a regulation pool table, bar with a beverage cooler, separate ice machine, microwave and sink, whole house sound system for main living areas, flat screen TV and gorgeous ocean views. To the left of the living area, you will find an oceanfront Queen suite and an interior King suite, both with private full sized bathrooms. Continue down the hall and find a secondary laundry room with a stackable washer and dryer – conveniently located to avoid carrying loads of laundry up or down floors! At the end of the hallway, you will find the Bunk Bed Suite – perfect for the kids! This suite features three custom-built twin bunks, one with a trundle bed (a total of seven twin beds) and a bathroom with separate water closet for privacy. To the right of the living area, a master suite invites you in with a King and Queen bed, spacious bathroom with shower and jetted tub, and access to the Oceanside deck. Follow down the hallway to access the guest powder room. Continue on and you will find the best treasure on this floor – your own private movie theater! Watch your favorite shows, movies, or the big game on this 110” screen television. Relax in one of the nine power reclining chairs or snuggle up in one of the two oversized round chairs for a cozy night of binge watching! Once the awe of the movie theater room settles down, your jaw will drop again at the sight of the gorgeous set of double curved staircases leading up to the main floor and the magnificent crystal chandelier hanging above (triple the size of the one in the foyer)! Custom LED strip lighting also outlines the curve of the staircases for ambient lighting at night. It truly is a GRAND entrance! At the top of the double staircases, you will find a soundside “conversation” deck overlooking the front of the manor – perfect for relaxing with a cup of tea in the evenings while watching the sun set over the ICW. To the left of the staircases, a Queen suite with a Twin Daybed is tucked away with it’s own private bathroom – a great room for the guests who have children and want the extra space and quiet. To the right of the staircases, you will find a suite with two Queen beds and a private bathroom. Continue past the laundry and you enter into a gorgeous and spacious open floor. First, you see the immaculate coastal kitchen featuring the largest kitchen island you have ever seen! A farm sink, two full sized dishwashers, built in microwave drawer, cabinetry, bar seating for four, and one enormous slab of beautiful granite complete the entire set up of this chef’s dream kitchen island. You will also find a full sized refrigerator and separate full sized freezer – perfect set up for storing all of your groceries during your stay. A 48” commercial grade gas oven and stovetop combo with built-in pot filler in the backsplash make this kitchen very efficient and luxurious. In the corner of the kitchen, you will find a walk-in pantry large enough to store all your dry goods and more! Continue through the room and you will find a large dining area complete with two beautiful twelve seat wooden tables: each with elegant crystal chandeliers above, tufted parson chairs, and a wonderful ocean view. Next to the dining area, you enter into the spacious formal living area (that also doubles as a wonderful dance floor for weddings and events)! This living area features comfortable seating, a bar with a beverage and wine cooler, sink, and a gorgeous palladium window overlooking the ocean. Turn around and you will have the best view of the main crystal chandelier located in the grand staircase. Off the living area, you will find the formal guest powder room and the master suite – perfect for the bridal party to get ready for the big day! This master suite features a King bed, elegant cherry furniture, a cream leather chaise (perfect for pictures of the bride), two full-length mirrors, and a spacious bathroom. The bathroom features a private water closet, large rainfall shower with two shower heads, jetted two person tub, and triple vanity (with extra lighting for makeup application). This master suite also includes an extra large closet – perfect for storing a bridal gown and bridesmaid dresses, as well as access to the oceanfront deck with your own bistro seating. Off of the living area, you will also find a spiral staircase leading to the top floor private master suite. This master suite features a King bed and private upscale bathroom – perfect for the bride and groom! If you thought this home couldn’t get any better, wait until you go outside! 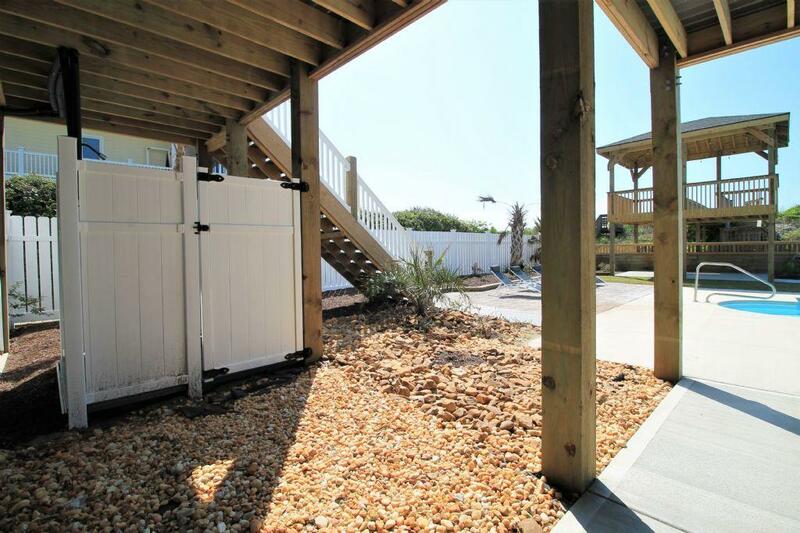 With two levels of expansive oceanfront decks, an outdoor kitchen, a pool and a hot tub…the amenities are endless! There is also a Tiki Bar down by the pool for serving up cold drinks in the summer and an oceanfront gazebo providing shade when you need to get a break from the sun! Be among the first to experience this incredible and luxurious oceanfront manor, complete with all of the upgraded amenities you could ask for and more than enough space for all of your family and friends! What an amazing rental company! "What an amazing rental company! We rented Topsail Manor for our wedding in March of 2019, and every person we dealt went above and beyond for us. We toured the property twice, and Brassai answered our millions of questions. She, Staci, and Amber took care of every step during our booking and stay. We have rented beach houses my entire life, and I have never had the level of service the Access team provided. They were professional, patient, and warm through my numerous questions and requests. We had some minor (water heater and freezer malfunctions) issues at the house during our stay, and they were immediately on site with the fastest service imaginable. I would 100% recommend Access Realty, and if you are looking for an amazing wedding venue then look no further than Topsail Manor. I had two venues cancel on me after signing contracts, so I finally gave another look at Topsil Manor. I originally (and incorrectly) thought I wanted more bedrooms for family/friends, but 8 was the perfect amount. We have all joked that the 3rd time was a charm; Topsail Manor was the perfect venue for a beach house wedding. The house is perfectly designed for large gatherings with a ton of socializing We had 100 people at our wedding and never felt cramped. The amount of thought and planning put into this house is phenomenal - the 64 speaker system is perfect for keeping music playing and can be controlled by different regions. The bedrooms and baths are large and spacious, and the elevator makes catering and bringing in heavy loads a breeze. The kitchen, 3 bars, pool/hot tub, full theater, and pool table allow guests plenty of space. I can’t say enough wonderful things about my entire experience - the Access team, the house itself, and Topsail Beach made my wedding experience the best event I could have ever imagined. " "Oh my gosh- Topsail Manor is amazing! I would highly recommend!! We can't say enough about how awesome this house is!" "Just wrapping up a week at topsail manor. We’ve rented large homes up and down the carolina(s) coast for the last several years, and this is without question the best house we’ve had. It offered everything we needed for a family of 18... plenty of room, an amazing pool/hot tub, a ridiculous theater room, and of course easy access to the beautiful beach. The house is clean and luxurious... we hope to be back next year!" Hands down the absolute prettiest house I have ever stepped into. "Hands down the absolute prettiest house I have ever stepped into. We were the first ones to stay here and it blew us away. The layout, decor, modern finishes, movie room, billiards room. All 8 bedrooms have a private bath. And the pool/hotub combo is amazing. This is the only place designed for destination weddings yet also perfect for reunions and large family gatherings. You would be doing yourself a disservice if you didn’t check this place out. Access realty was amazing to work with! We will be staying again as it was the best place and vacation ever!"